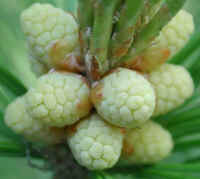 (White Pine (Pinus strobus) - 01) Most people don't realize that the white pine is a flowering tree, because we don't see the usual kinds of flowering, but the white pine does flower as shown in this picture. 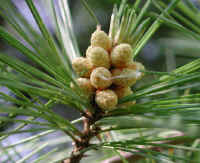 One of the interesting aspects of the white pine is that its needles are in groups of five. (White Pine (Pinus strobus) - 02) This is another photo of the bloom of the white pine. White pine can grow as tall as 100 feet and can be identified from fairly long distances because of the way they tower over the other trees in the eastern forests. (White Pine (Pinus strobus) - 03) Note the new growth of pine needles emerging from the top of the bloom, and the broken needle cluster on the left side of the bloom cluster in the photo. (White Pine (Pinus strobus) - 04) This is a close up view of the white pine bloom. 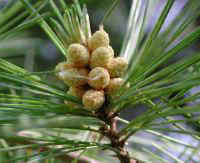 One of the characteristics of the white pine is their long and relatively large cones. 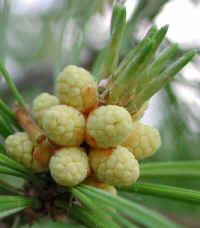 The white pine is yet another example of the wonders of God's creation.